Our full-service metal shop provides custom copper for all your needs. 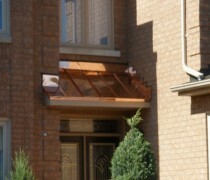 We have created many beautiful copper accents from turrets to bay windows to eavestrough. Some of our creations can be seen in our Photo Gallery. Contact us to discuss how copper can be used to make your home stand out!